Oh, my. I just had my very first Cook Out experience. Cook Out is a fast food restaurant chain that is located throughout the Southeast. I have driven past them here and there over the years, but never actually eaten at one. But tonight I really wanted a milkshake, they had recently opened one near my work, so I tried one and all I can say is YUM! Okay, so I had a cheeseburger, that was cooked on an actual grill…. Like the type you eat at a cook out (hence the name). It was moist, tasty and actually cooked perfectly. It came with two sides, I got french fries and hush puppies. The fried were rather mediocre, but the hush puppies were yummy. As anyone who knows me can attest, I have a slight obsession with hush puppies. They are one of my favorite Southern dishes, so I am super pumped that I can get them in a drive-through. Let’s just ignore the fact they are odd shaped and horribly unhealthy. Okay, so the highlight was the milkshake…. it was so thick and creamy and great tasting. I opted for a peanut butter fudge shake (continuing my ongoing obsession with the peanut butter and chocolate combination). They had about 30 different flavors though… peach cobbler, chocolate cherry, toffee, blueberry cheesecake, pineapple… the list goes on! I am so having the toffee one! They are also the only fast food joint I know of that serves Cheerwine, but that is a topic for another day. I guess the thing that was rather surprising was the line. Really, really, REALLY long line, even in the drive through. I am guessing because it is because classes start tomorrow so a ridiculous amount of college students just returned to the city and wanted food fast. The other odd thing is the strong religious tones… the cups and bags all make reference to different religious sayings. Such as listing specific bible passages and God Bless America. Not saying that is a good or bad thing… just something that you don’t see very often. But heck, this is the South and is the bible belt (also a topic for another day) and it is a Southern company, so I guess it is not that surprising. The shake cup got dropped walking up to my apartment and cracked, so had to go into a glass at my place.... hence the mess. So, yes…. I enjoyed my first Cook Out experience and willing be going back again. It is going to have to be a few months though, I am not sure my body can take that much grease that often! 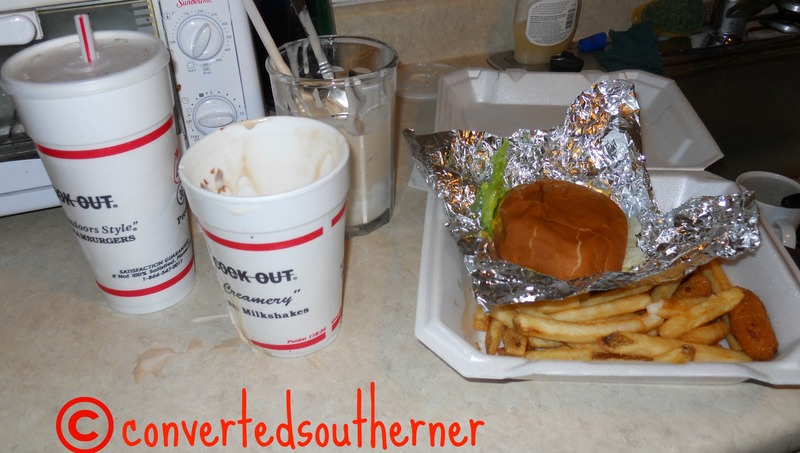 I loved CookOut when I was in Raleigh….and the hushpuppies and milkshakes (strawberry banana) were always my favorites!